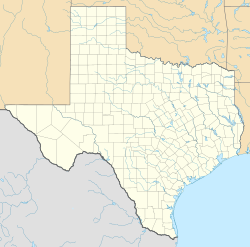 Kingsville is a city in and the county seat of Kleberg County in the southern region of the U.S. state of Texas. Located on the U.S. Route 77 corridor between Corpus Christi and Harlingen, Kingsville is the principal city of the Kingsville Micropolitan Statistical Area, which is part of the larger Corpus Christi-Kingsville Combined Statistical Area. The population was 26,213 at the 2010 census, and in 2016 the U.S. Census Bureau estimated the population at 26,071. Named in honor of Richard King, Kingsville's first buildings were constructed in 1904 along the newly completed, now defunct, St. Louis, Brownsville and Mexico Railway line, adjacent to the famous King Ranch. The city was incorporated in 1913. It is home to Texas A&M University-Kingsville, a member of the Texas A&M University System, and Naval Air Station Kingsville, one of the U.S. Navy’s two locations for jet aviation training. With the continued growth of the King Ranch in the mid to late 19th century, the desire for a railroad through the region increased, both to connect the communities of the Rio Grande Valley to the rest of Texas, and to serve the King Ranch. At the turn of the 20th century, Henrietta King deeded a portion of the ranch to entice the construction of a town and to bring the railroad adjacent to the ranch. Robert Justus Kleberg, Jr., the ranch manager, formed the Kleberg Town and Improvement Company in 1903, tasked with planning and constructing the town. In 1904, the community was planned three miles from the King Ranch headquarters and was named in honor of the founder of the King Ranch, Richard King. That same year, construction of the St. Louis, Brownsville and Mexico Railway reached Kingsville, and the first train passed through the town on July 4, 1904, considered the founding date of the city. Kingsville's first post office was also established that year. Kingsville is located in South Texas, approximately 33 miles (54 km) southwest of Corpus Christi, 91 miles (146 km) north of Harlingen and 101 miles (163 km) east of Laredo. According to the United States Census Bureau, in 2010, the city has a total area of 13.9 square miles (36 km2), of which 13.8 square miles (36 km2) is land and 0.04 square miles (0.10 km2) (0.22%) is water. Kingsville is located in the geographic Gulf Coastal Plain region of the United States, known as the Coastal Bend in Texas, bordered by the Gulf of Mexico and Baffin Bay to the east, and the South Texas Plains or brush country to the north, west and south. Mesquite trees are found throughout the region, along with several types of cacti. The city is surrounded by farmland producing various crops including cotton and sorghum. The terrain around Kingsville is generally flat, with an elevation of 59 feet above sea level at city center. Several creeks run through the city, including the San Fernando, Santa Gertrudis, and Escondido Creeks, all feeding into Baffin Bay. In 2009, the population density of Kingsville was 1,848.8 inhabitants per square mile (713.8/km2). There were 10,427 housing units with an average density of 753.8 per square mile (291.1/km²). The following statistics come from the American Community Survey 2007-2011 five year estimate. There were 25,994 residents in 9,103 households, and 5,837 families living in the city. 1,192 housing units were vacant. The rental vacancy rate was 9.3 percent while the homeowner vacancy rate was 3.9 percent. 57.1 percent of all housing units were built between 1950 and 1979. Only 9.9 percent were built in 2000 or later. The median value of an owner-occupied unit was $69,500. Of the 9,103 households, 36.5 percent had children under the age of 18. 40.6 percent were married couples living together, 17.5 percent had a female householder with no husband present, and 35.9 percent were non-families. 25.0 percent of all households were made up of single individuals, and 8.5 percent had someone living alone who was aged 65 or above. The average household size was 2.67, and the average family size was 3.26. The racial makeup of the city was 83.3 percent White, 4.7 percent African American, 2.8 percent Asian, 0.6 percent Native American, 0.1 percent Pacific Islander, 6.8 percent from other races, and 1.7 percent from two or more races. Hispanics or Latinos of any race made up 72.4 percent of the population. The population was spread out with 30.1 percent under 20 years of age, 39.2 percent aged 20 to 44, 18.9 percent aged 45 to 64, and 11.9 percent aged 65 or above. The median age was 27.6. For every 100 females, there were 106.5 males. For every 100 females aged 18 and over, there were 107.3 males. For every 100 females aged 18 to 64, there were 114.1 males. For every 100 females aged 65 and over, there were 74.2 males. The median household income in the city was $33,785, and that for a family was $43,167. Males had a median income of $44,854 versus $26,447 for females. The per capita income for the city was $18,271. About 20.0 percent of families and 27.7 percent of the population were below the poverty line, including 30.7 percent of those under 18 and 12.0 percent of those aged 65 or over. The unemployment rate expressed as a percentage of persons aged 16 and over, was 6.7 percent. The unemployment rate, when expressed as a percentage of labor force participants aged 16 and over, was 11.4 percent. The city's public schools are operated by the Kingsville Independent School District, Santa Gertrudis Independent School District, and Jubilee Academic Center. Private Schools - St.Gertrude Catholic School, Epiphany Episcopal School (PK-G5), Presbyterian Pan American School. The climate in this area is characterized by hot, humid summers and generally mild to cool winters. According to the Köppen Climate Classification system, Kingsville has a humid subtropical climate, abbreviated "Cfa" on climate maps. Lynn Adams, golfer, a one-time winner on the LPGA Tour. Ronnie Bull, professional football player. Jeff & Greg Burns, composers of electronic and orchestral music. Brothers Lauro Cavazos and Richard E. Cavazos. Lauro served as Secretary of Education and was the first Hispanic to serve in the United States Cabinet. Richard was the U.S. Army's first Hispanic four-star general and served as head of the U.S. Army Forces Command. Chuck Clements, quarterback for the New York Jets. Kennedy M. Crockett, U.S. Ambassador to Nicaragua from 1967 to 1970. Matthew Dear, music producer, D.J. and electronic avant pop artist. Steve Denton, professional tennis player, and tennis coach at Texas A&M University. M. Stanton Evans, journalist, author and educator. Roberto Garza, a football player for the Chicago Bears. Donald Hollas, professional football player. Zona Jones, country music singer, and attorney. Richard M. Kleberg, a seven-term member of U.S. House of Representatives and an heir to King Ranch. David L. Lindsey, a novelist working primarily in the mystery and crime fiction genres. Eva Longoria, an actress, and model. Jack Mildren, an All-American quarterback at The University of Oklahoma, professional football player, oil company owner, 13th Lieutenant Governor of Oklahoma, and bank executive. Dwayne Nix, football player elected to the College Football Hall of Fame. Luke Patterson, professional football player. Kit Pongetti, actress, singer, and writer. Irma Rangel, lawyer and state representative from Kingsville. Reality Winner, accused classified document leaker. Willie Wood, a professional golfer who played on the PGA Tour, Nationwide Tour, and Champions Tour. ^ "Annual Estimates of the Resident Population: April 1, 2010 to July 1, 2016". American FactFinder. U.S. Census Bureau. Retrieved 4 January 2018. ^ a b c "Kingsville, TX". Texas State Historical Association. Retrieved 4 January 2018. ^ "About Kingsville". City of Kingsville. Retrieved 5 January 2018. Wikimedia Commons has media related to Kingsville, Texas.